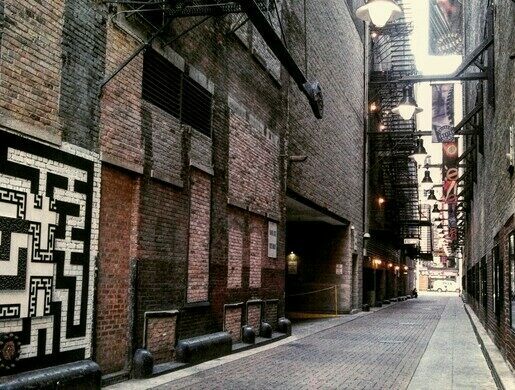 Couch Place is the official name of the unassuming alley that sits in the middle of downtown Chicago, just behind the legendary Oriental Theatre. Today it serves as a pass-through for pedestrians, holding the stage door for the Oriental and its loading area. In 1903, however, this alleyway was the site of unimaginable horrors. Prior to the construction of the Oriental Theatre in 1926, the little bit of land on Randolph Street between State Street and Dearborn was home to the Iroquois Theatre. It was constructed hastily in the summer and early fall of 1903. The Iroquois was hyped up to be the best of the best, extra elegant, reportedly costing over a million dollars. In newspaper adverts, it was even touted as being “ABSOLUTELY FIREPROOF.” As history teaches us, however, if there’s one thing that someone should never do it’s brag about their theater being fireproof or their ship being unsinkable. On December 30, 1903, the Iroquois was hosting a matinee showing of its first and only performance of Mr. Bluebeard, a musical comedy from New York with a vague plot about a man who married women and then murdered them, hiding their bodies in a closet. For this particular performance, the Iroquois managed to sell out all 1,724 seats in the house—and then sold a few hundred extra tickets as standing room only. Midway through the show, a stage light sparked, catching the highly flammable backdrops on fire. The crew backstage did their best to snuff out the flames, attempting to use Kylfire, a sort of fire extinguisher in powder form. Unfortunately, since the fire was above the stage, the powder couldn’t be thrown onto the flames. The fire spread instantly, and the audience realized something was terribly wrong. As the crowd started to panic, the star of the show, a vaudeville actor named Eddie Foy, tried to calm the crowds and urged everyone to calmly and quietly leave the building. Unfortunately no one listened to him. People rushed out of their seats, only to realize that they couldn’t easily find exit doors since none of them were labelled. When they did find the emergency exits, they discovered that all the doors used a bascule lock, popular in European theaters but unknown to Chicago theater-goers. No one could figure out how to unlock the doors. For the few who could open the locks, they were quick to realize that all exit doors opened inwards, not outwards. With hundreds of people pushing behind them, it meant that no one could actually open the doors. Onstage, they had tried to lower the asbestos fire curtain, but part of it snagged on lighting equipment, and it only lowered halfway. There was a skylight above the stage that could be opened in case of fire as well, so that the smoke and flames would travel upwards, away from the audience. Despite the crew’s best efforts, the skylight seemed nailed shut and would not open. When the door backstage was opened to let the cast out, it let in a big gust of cold air, feeding the flames and then sending a fireball out into the house. For those in the upper levels, their fate seemed even worse. Those who tried to exit the theatre and head back to the main staircase in the lobby found themselves locked inside by metal accordion doors; it was customary to lock people in the upper levels when the house was sold out so that no one would sneak down to the more expensive seats. Several people found doors that led to the fire escapes onto Couch Place, but these escapes were frozen and couldn’t be lowered all the way to the ground. In their panic, people began jumping to the brick alley below. Many died this way, though some survived when their falls were cushioned by those who had jumped just before them. Several people were able to crawl to safety across the alley as well. Tenants in the building on the other side of Couch Place noticed the panic and had ladders and a few two-by-fours handy. They extended these out windows to those stuck on the fire escapes. 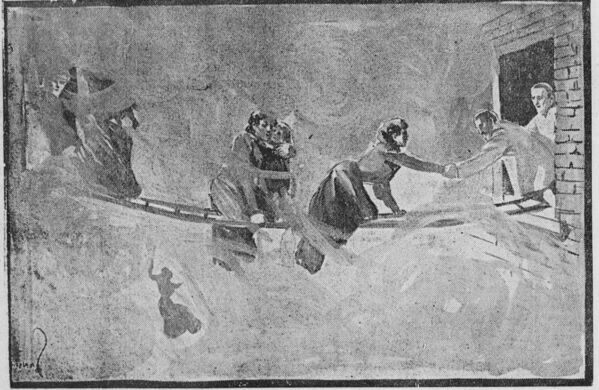 Some people were able to successfully crawl across the narrow makeshift bridges, some fell to their deaths, and others had the bridges slip from under them, sending them to the alley below. Overall, the fire lasted only 30 minutes but claimed the lives of over 600 people. The majority of the dead that weren’t found in the theatre were outside on Couch Place; some sources reported that the bodies were piled six feet high. If you go there today, you’ll find adverts of upcoming shows at the Oriental Theatre and perhaps see cast members of current shows as they enter through the stage door. Local lore says you might feel a cold breeze on your shoulder or even hear your name called by those who might haunt such a place of death. Strangely enough, there’s no memorial marking the location of the Iroquois Theatre fire, but the ripples of the disaster can still be felt today, through building fire codes. After the fire, laws were quickly enacted stating that exit doors had to be labelled and that all exit doors must open outwards. Couch Place today is an inconspicuous side street, despite the terrible memory of the fire from so long ago. Located behind the Oriental Theatre.